Not all undrafted rookie stories have happy endings. On Wednesday, the Denver Broncos announced that third-year running back Mario Fannin has been waived. Fannin (5'11", 224 pounds) entered the league out of Auburn as an undrafted college rookie with Denver in 2011 but battled injuries throughout his time with the team. After spending the last two seasons on Denver's injured reserve list, Fannin's tenure with the team has come to an end. After Fannin's release, Willis McGahee, Ronnie Hillman, Knowshon Moreno, Montee Ball, Lance Ball, Jeremiah Johnson, and C.J. Anderson are the seven remaining running backs on the roster (eight if you count fullback Jacob Hester). 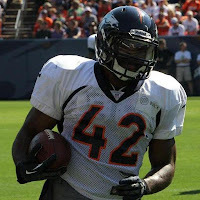 Denver also on Wednesday designated safety Blake Gideon as reserve/retired. Gideon signed a future contract with the Broncos in January. Going into training camp, Montee Ball and Ronnie Hillman figure to be the only "locks" to make the team after being selected in the second and third rounds, respectively, over the past two years. Denver's training camp schedule is expected to be announced in late June.